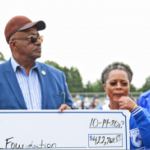 ECSU Chancellor Thomas Conway, far right, announces the presentation of a check for more than $400,000 by the National Alumni Association to the ECSU Foundation during the 2017 Homecoming game halftime, Oct. 14. At the presentation were Vice Chancellor for University Advancement Dr. John Lee, left, NAA President Abdul Rasheed, center, and Barbara Sutton, director of the ECSU Office of Alumni Relations. “Our goal right now is responding to the enrollment numbers that have been down, and trying to work and support the university administration in getting the enrollment back where it should be,” said Rasheed. Rasheed says the initiative will allow alumni to make donations at any level. The hope, he explained, is that each alumni chapter will be able to meet a set goal in effort to achieve the overall $10 million goal. “We’ve been working on the infrastructure with the university to put in place the technology and systems that would allow alumni to make their contributions directly to the (ECSU) Foundation by way of different technological sources,” said Rasheed. The NAA, he said, is also working promotions and marketing strategy, and infrastructure to get each graduating class organized. Each class, he said, will have a “class agent,” responsible for working with the NAA to not only raise funds, but also bring in more association members. Rasheed says that the money that is raised through this initiative will be given to the ECSU Foundation. It is then up to the Foundation to distribute the funds by way of scholarships. “The money will be given to students according to need by the university’s foundation, the University Office of Development, and academic agents (faculty),” he said. “So nobody has to strain and hopefully not sacrifice beyond their means,” he said. Rasheed explained that there are some alumni who cannot afford more than a few hundred dollars, and that’s fine. But also, there are those, such as the Class of 1971’s John Best who are financially able to give generously.